So this textured polish thing is still going strong, it seems. I'm trying to learn to love it, I really am. It's getting easier as the textured shades get more varied. Now that pretty much every brand has done their take on the trend, it's getting much easier to figure out what I like. What I like has turned out to be shimmers. No surprise there, since I love "normal" shimmers. Texturted creams creep me out a little, textured jellies look patchy to me, and textured glitters have never tempted me much at all because of the way the glitters stick out. 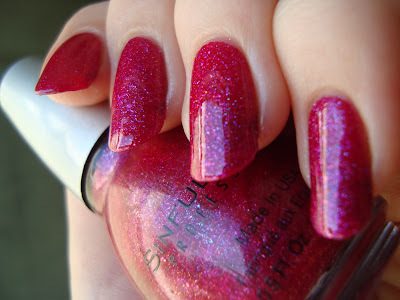 Sinful Colors' new Crystal Crush collection at Rite Aid piqued my interest because it's almost all textured shimmers. I wound up buying three, though I spent a while looking at the rest. Blue Persuasion has glitter instead of shimmer, so I skipped it. The yellow of Face The Facets is weirdly appealing to me, even though I don't like yellow, but I passed on it. Ruby Mine, Orange Crush, and Purple Gleam didn't catch my eye. They're surprisingly summery colors overall for a collection that's only just come out recently. I'll admit it, I picked the ones closest in base color to some of my Sinful Colors favorites. 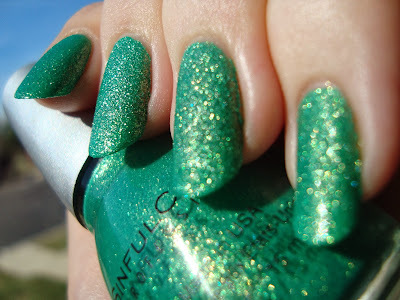 Emerald Envy has a jungle green base packed with bright gold shimmer. How perfect is this....and it's...a one-coater!! Woohoo! One of the issues I have with a lot of the textured formulas is difficulty applying a second coat. Happily, Emerald Envy really doesn't need it. It's pretty effortless as textures go too. You can see a couple of thin spots in my photos, but I don't think you'd notice them much in person. The sparkle here is just amazing. It's a contender for the title of my favorite texture. The Crystal Crushes aren't as rough and jagged as many of the other textures, which is a plus for me. They're only slightly bumpy. The shimmer settles down when it's not in direct sunlight, but that just makes the beautiful base color even more noticeable. 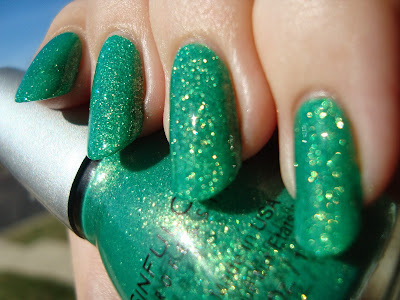 With top coat Emerald Envy becomes almost unbearably shimmery in direct sunlight. Wow! It sparkles a lot in softer light too. I like it this way, but I think it's one of only a few that I actually prefer without top coat. Treasure Chest has a sky blue base with bright gold shimmer. The shimmer in Treasure Chest lacks the oomph of Emerald Envy. It's also a bit bumpier and goes on thicker. It's a one-coater too. No question, I think it looks better without top coat. I like it, but I feel like I'd appreciate it more if I didn't have Emerald Envy to compare it to. Got A Blush On You has a magenta jelly base loaded with blue and pink shimmer. I could tell this one would be sheerer than the other two, but I wasn't prepared for how sheer it was. It's considerably sheerer than the other jelly-based texture I tried, Zoya Liberty. This is two coats, but with its jelly base I think my nail line would still have been visible with a third. I'm not crazy about how pink it is, but it's so translucent that I might try layering it over something darker before passing it Nichole's way. I want to like it, but it's very girly. The shimmer is the strongest of the three I tried. It's really impressive! Top coating it boosts the shimmer even further, but also makes the pink very glowy. If it was more berry and less magenta, I'd probably love it, so layering might have to happen. 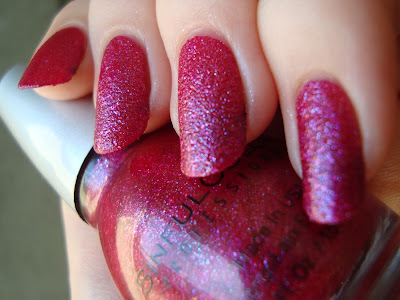 I want to love the sparkle, I really do! 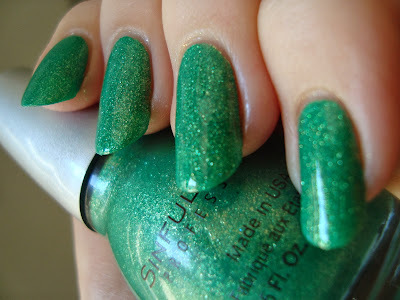 Bottom line: Emerald Envy is great! If you've still never tried a texture, it might be a nice intro. The color is surprisingly wearable, for me at least. Treasure Chest pales in comparison because it doesn't have as much shimmer impact, but it's nice enough. Both are one-coaters. Got A Blush On You is sheer, but the shimmer is outstanding. It's pinker than I expected based on the bottle. Overall, I like these more than most of the textured polishes I've tried. I really need to get a hold of these! I agree! They're worth tracking down! Ooh a green texture! The other two kind of remind me of (non textured) zoya shades, Zuza and alegra. Why can't I find these anywhere? ?